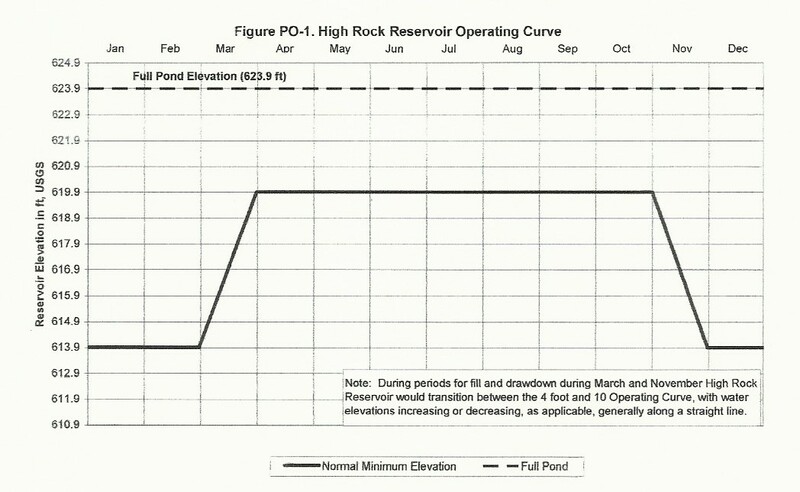 The High Rock "Interactive Rule Curve"
Cube Hydro must operate High Rock Reservoir at or above the normal minimum elevation (NME) as depicted on the High Rock Operating Curve (Figure PO-1), except as needed in order to maintain minimum flows or as provided under the Low Inflow Protocol (LIP) or the Hydro Project Maintenance and Emergency Protocol (HPMEP). High Rock Reservoir may be drawn down below its NME in order to meet the Required Minimum Instream Flow at Falls, as specified in Article PO-2, only after Narrows Reservoir has reached its NME. If High Rock Reservoir water elevation is below the NME at 12:01 AM on any operating day, where the operating day is defined as 12:01 AM through 12:00 midnight, Cube Hydro must reduce releases from High Rock Reservoir for that operating day up to a maximum of the daily average flow equivalent of the minimum flow requirement at Falls, as specified in Article PO-2. Under this condition, releases from Falls Dam will be limited to those defined in Article PO-2. From April 15 through May 15 of each year, Cube Hydro must maintain reservoir water elevations at all four Project reservoirs no lower than -1.0 feet below the elevation of each reservoir on April 15 to enhance conditions for fish spawning in the reservoirs. No later than August 31 of each year, Cube Hydro must report the resulting reservoir water elevations at each reservoir during the April 15 through May 15 period in a letter report to the North Carolina Wildlife Resources Commission (NCWRC). The letter report must provide an explanation of any circumstances that prevented Cube Hydro from maintaining the target water elevations. Within 60 days of filing the letter report with the NCWRC, a copy of the letter report must be filed with the Division and FERC. Satisfaction of these reporting commitments constitutes compliance with this Article.